A larger than usual turnout for our AGM were treated to lots of positives from last season. The nicer one of the Eddie Cox’s congratulated Josh on his organisation of two great DH trips during the year. He had high praise for Josh and all who travelled on both trips and proclaimed his undying love for all of us – it was a truly touching moment!! Liam brought us all back to reality as he gave his report on the season as secretary – his biggest gripe was the cost of texting on his mobile, so don’t expect to hear from him again. (Did I hear a hooray in the background?!?). Liam also reiterated that you must be a member of West Ham to book tickets for trips next year so asked us all to register or renew our memberships early and pass on our membership numbers to him as soon as possible. Next up was the financial report given by Jimmy Conway – who was sporting a new Armani suit. Jimmy was pleased to say that the season had gone very well financially so much so he bought us all a pint (mind you he legged it before actually paying!). He had great praise for “Mr Spot the Ball” Dessie Doyle, the sale of Timmy Lloyd’s DVDs and the returns from the quiz night. He welcomed any new ideas for fundraising that the members might have. Brian Madden thanked Paul, Jimmy and myself for all the contributions to both the website reports and the Facebook page and said that he welcomed more quotes, photos and articles that can be uploaded. Timmy Holland at this stage was in a hurry to get to the bar so he proposed Liam as Secretary. He was informed that the elections weren’t open yet. The meeting was opened up to the floor and various topics on a mini golf classic, another quiz and merchandising were discussed. Timmy again proposed Liam as Secretary and was asked to hold off on that. Finally, the elections came up and Eddie Cox was elected Chairman, Timmy again proposed Liam McDonagh as Secretary, so we elected him again! Josh Holland was elected Travel Secretary, Jimmy Conway was elected Treasurer again (and immediately phoned Louis Copeland). Brian Madden and Timmy Lloyd were also re-elected for the coming year – both of who were highly praised by Liam (the man has gone soft!!). Then it was off downstairs to the bar and stories were told of past trips and various tales from the play off final – Gary and the swinging lady, Tommy 4 and his fame in Bulgaria on the play off final day and Brian Madden and his chipper story were the highlights and had us all doubled up laughing. It proved to be a great night and as we all said our goodbyes we all looked forward to August when it all starts again. WEST HAM 2 vs BLACKPOOL. Play-Off Final. Click here to read a report and see photos from the 2012 Play Off Final. WEST HAM 3 vs CARDIFF CITY 0. Play-Off Semi Final - 2nd Leg. Click here to read a report and see photos from the 2012 Play Offs. CARDIFF CITY 0 vs WEST HAM 2. Play-Off Semi Final - 1st Leg. LEICESTER CITY 1 vs WEST HAM 2. So it's all down to the last game of the season! A band of merry dublin hammers gathered to see if the West Ham could do the double over Leicester City and give us the glimmer of hope of automatic promotion. Win they did, but only after coming from behind. They dominated the early stages, but fell a goal behind when Beckford rose unchallenged in the area to head Leicester ahead! It wasn't long before Winston Reid equalised from close range from a cross from Collison. With no food at half time, the drink started to take it's toll and the meeting became gradually louder as the second half wore on! Again West Ham dominated, but huffed and puffed not really creating too much, then as Leicester started to press themselves the ball fell to Collison on the edge of the area, his shot flew into the net causing the noise levels to go up even more… we even had a chorus of bubbles! Everyone now called for West Ham to attack, maybe up our goal difference… but no, the BFS factor kicked in… Cole, our only striker was subbed for a defender… a corner was played so short it couldn't have moved more than 6 inches, where the west ham players stood over it… Cries of derision poured from members… strains of "we want di canio" were heard coming from west ham's away support… even so, Nolan somehow missed a sitter in the closing minutes. However, we won and are 2 points behind Southampton going into the last league game of the season. A win and a Southampton loss and we are up… I can't see it myself. However, for those of us who are traveling over for the last home game of the season… it could be one hell of a piss-up… stranger things have happened! WEST HAM 3 vs BIRMINGHAM CITY 3. A busy Easter weekend saw the Hammers play Barnsley away on Good Friday and Birmingham City at home on Easter monday. Members were in an up-beat mood after the thrashing of Barnsley… with Southampton and Reading opening a gap at the top, could we get the much needed home win? Birmingham set themselves up with 5 in midfield and defended deep. This has become the standard away team tactic at Upton Park this season, and… as usual… West Ham struggled to make chances. About half way through the first half we lost possession and Birmingham ran down the other end and scored… one chance, one goal… easy as that… Minutes later we lost possession... again.... the ball was played through to King who calming slotted the ball past Green… WTF! To their credit West Ham came back into the game and just before half time got a goal back with a Vaz Te header. The noise levels rose in the meeting and the air of "what a bunch of twats" lifted… OK, so 2-1 at half time… but oh no… their was still time for Birmingham to score a bizarre third! The shot was hit into the ground, it bounced up and looped into the net… WTF! Half time and the air was filled with Brian 'Barrow Boy' Madden's shouts of "Polo Shirts, get your Dublin Hammers Polo Shirts". A steady stream of punters visited Brian's stall set up on the bar! Lansbury came on for the second half as West Ham went at Birmingham from the whistle. They started creating chances and with 20 minutes left Cole turned in the box and scored with a low shot… COYI’s… noise levels rose again as we urged the Hammers on… we came close a few times… then with 5 minutes to go, Lansbury's rocket of a shot hit the hands of a defender and the ref gave a penalty, with Noble off the field, Vaz Te stepped up and in true 'Julien Dicks style' hammered his shot into the back of the net. The last few minutes were frantic as we tried to get the winner, but it wasn't to be! So 3-3… an entertaining game for sure... but not what we needed… think it's the play-offs for us now. WEST HAM 1 vs MIDDLESBOROUGH 1. Well what a pile of shite that was... one up front at home... the ball in the air for 85% of the game... losing posession time and time again... static... I could go on, but am rapidly losing interest... the academy... oh how we laughed! A good turn out saw a poor display by a West Ham team lacking any creativity or spark. The biggest cheer of the first half came when the Reading score (they were losing) flashed up on the screen! Thank goodness for the sandwiches at half-time. Right, lets crack on and finish them off... oh no... 5 minutes later Boro ran down the other end and scored a peach of a goal. I have to confess, I don't like the look of the way we are shaping up for the run in and if by some chance we do get promoted... on this showing... god help us! CARDIFF CITY 0 vs WEST HAM 2. West Ham v Cardiff on the BBC, deja vu, the last time we played Cardiff was the first game of the season on the BBC. On that day I was worried about life in the Championship... was the Dublin Hammers membership going to drop... the answer was No! With the match being on early Sunday afternoon and on BBC 1, there was a very good turn out for this meeting with a few younger members in tow. This was a must win match, with Reading winning away to Millwall they were only one point behind the Hammers. Cardiff came into this game after losing to Liverpool in the Carling cup final so were they going to come out guns blazing or would they be licking their wounds. The West Ham team lined up with Nolan back in the side after his 3 match ban and Maynard was up front on his own. The Hammers looked well in control and it was Nolan, on his return, that opened the scoring 2 minutes before half time, Maynard played a lovely ball into Nolan from the edge of Cardiff’s box for the midfielder to slot home a low right footed shot past Marshall into the far corner. Half time then, and it was time for the 'free trip draw', in all we had 4 trips up for grabs. The draw went ahead with Kellie, Paige, Gemma and Louie (four of the younger members in attendance) drawing the winning names. Well done to Josh, JT, Dessie and Dave Reid all on their way to the Hull match with flights match ticket and accommodation taken care of... lucky sods. As soon as the draw was over, Fran Ryan donned his cap and coat and exited stage right, some members suggesting he’s a bad loser, but no, I can tell you now, he was off to see his son Mark play a match. In the second half Maynard was putting himself about which was good to see. The Hammers had chances to double their lead when Ricardo Vaz Te capitalised on another defensive lapse by Cardiff but while his poked shot beat Marshall, it did not beat Hudson, who cleared the danger. Whittingham came within an inch of throwing Cardiff a lifeline but his 25-yard left-footed free-kick cracked Rob Green's left-hand post with the West Ham keeper beaten. Then George McCartney made a fine run down the left and got his cross into the box only for the ball to rebound back to him, he took a shot with his weaker right foot the ball found the back of the net to make it two nil. Cardiff did manage to rifle the ball off the crossbar in the dying minutes but the game ended with a 2-0 victory to West Ham. Fingers crossed we can see it through till the end of the season! Hope to see you all again on April 9th, Easter Monday for the Birmingham match. WEST HAM 0 vs CRYSTAL PALACE 0. An early kick-off saw a well attended meeting witness a lack-lusture performance from the Hammers. Palace defended well and in depth. We had to wait until Baldock came on in the second half for a decent goal scoring opportunity. Two came in quick succession, both made by Noble, both missed by Baldock. More worrying is the fact that with Portsmouth in dire circumstances, if they fold we are likely to be deducted the 6pts we have taken from them this season… we are the only team who have played them twice so far… take 6pts from our total and the table looks very different! THE 'WEST HAM QUIZ' NIGHT. Our quiz night caught one or two off guard as they hadn't read the text properly and invited some friends/family along who knew nothing about West Ham – some would say that they were in good company at certain tables! Anyway, Fran our President and Quizmaster told us that it would be a Level 5 quiz on things West Ham. The 6 tables of three, all looked at each other not knowing what level 5 was? Some wondered... had it anything to do with Level 42? Happily, I was on the same team as Gary Purdy, so I knew from the outset that I would win as opposed to my usual poor standard at quizzes! The questions to start us off were very general and even Aisling (who are West Ham?) got the colours of the gear question correct. Fran had it all organised to a tee and the picture round and Who Am I (you're Fran Ryan of course!) rounds were great fun (always remember – don't dive in to answer!). All the usual banter flew and as ever Eddie Cox and Liam both received yellow cards. Eddie received two yellows and was in danger with the two point deduction putting his score as a negative. Gerry Nolan's team of Mark Ryan (the next generation) and Lauren Cox were the early contenders for the Simpsons and held onto that position for the whole evening. When the results were called out, Jimmy Conway, Brian Madden and Josh breathed a collective sigh of relief as they were in danger of overtaking Gerry Nolan's dreadful showing. Aisling did get a yellow card at the end of the quiz when she questioned the Quizmaster's personal habits! The quizmaster did point out that the card would carry over to the next quiz. Our team of Gary Purdy, myself and team captain Tommy 4 led from the very start and finished as spectacular winners. I did answer 2 questions so it was a better showing from me than usual! 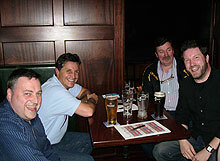 It was off to the bar afterwards as plans were made for the Milwall trip on Saturday. As ever a terrific night was had by all with lots of laughs. Congrats to Fran for putting the questions, the bell and the sound effects together and I hope he was able to sell those policies today after all the shouting! BIRMINGHAM CITY 1 vs WEST HAM 1. St Stephens day at Branagan’s and a good turn out by the members for this one. We all took our seats downstairs for the 5.30 pm kick off. West Ham entered this game in third spot after results from earlier in the day. With four minutes on the clock, Carlton Cole nicked the ball off a hesitant Ibanez and steered it home into the bottom corner past Myhill. West Ham had the best chances of the first half with Faubert getting more of the ball than any of his midfield team mates. It was Faubert who had a chance to put the Hammers 2-0 up with a great header which seemed to hit a Birmingham defender’s hand but the ref gave nothing. At half time a tin of roses was passed around by Liam. The second half started with Birmingham taking the game to West Ham, they had brought on Zigic and his height was starting to cause one or two problems as West Ham did not have a very big back line, with the likes of young Daniel Potts, only getting his second start of the season. When Birmingham's goal came in the 81st minute, it was a corner from Burke, it was not defended by West Ham and Murphy headed home at the near post. Not a West Ham defender in sight! Green lost it, asking who’s job was it to take up the position at that post. The game ended 1-1, but the bad news for the Hammers was the four yellow cards handed out that means Nolan, Faubert and McCartney will miss the Derby game. Keep an eye on the website for up coming games and meetings. Let me take this chance to wish you all a Happy New Year. Click here to read a report and see photos. WEST HAM 3 vs DERBY COUNTY 1. The match against Derby started at 5.20pm, so going into this match we knew that Southampton had lost, Middlesbrough had drawn, Leeds and Leicester had lost with only Cardiff winning... it was up to the Hammers to take advantage! A good crowd turned out for this match, not a full house but not far off. The game started off with Cole getting the nod ahead of Carew and then a big cheer went up as Gary came through the door with a fine looking crew cut. Sam Baldock was full of running and Cole seemed to up for the game. Then Baldock pulled up with about 20 mins on the clock, it was about this time that Gerry Murtagh arrived and asked "is there no bar" to which Jimmy Conway responded "yes, there is its in front of you, but we don’t have a barman on tonight". Back to the game, Piquionne was on for Baldock so was this going to be a long ball game. With 28 mins on the clock, Collison was robbed of the ball in midfield by Ward who played a ball straight through the West Ham defence for new boy Priskin to fire the ball in past Green. West Ham levelled the game in the 44th minute, Faye’s free kick was cleared, but Joey O’Brien got to the loose ball and looped it into the box for Cole to head home. At the break Liam took to the floor to remind everybody about the Christmas party next Saturday night. The second half saw the Hammers take the game to Derby. With about 20mins gone of the second half, Jack Collison laid the ball off to the Captain Kevin Nolan for him to hit a 25 yard screamer into the bottom corner... que the bedlam and arousing rendition of “I’m forever blowing bubbles” (we only sing when we are winning!). It wasn’t long after this we had a chance to go 3-1 up when we won a penalty. Piquionne had made a run into the box only for a Derby’s Craig Bryson to bring him down. Up stood Mark Noble to make it 3-1 with a well taken penalty. West Ham went on to see out the game without much trouble. I have to say this was a very good meeting, plenty of banter and some new faces, some from Athlone. Hope to see you all next Saturday, don’t forget your Spot Prizes. HULL CITY 0 vs WEST HAM 2. I was late arriving for the start of the match due to the fact that Dublin Bus had fecked up all the routes in my area! With that off my chest, down to business. Todays match was been screened in Murray’s of O’Connell Street. There was a small turn out for this game. The game itself was not a great one with Hull having the better chances of the first half. West Ham had made four changes to the line up after last Tuesday 0 – 0 with Bristol City. In came Carew, Diop, Faye and Collison. West Ham had only two half chances in the first half, headers from Nolan and Tomkins. Rob Green and Faye were keeping the Hammers in the game. Hull completely dominated the first 45mins. The second half started with West Ham making a change, Cole in for Carew. The change worked as only 4mins in the Hammers won a corner. As the ball came across the box Baldock lost his marker at the back post to volley in the first goal of the game. It looks like Baldock is a good signing as this was his 5th goal for the Hammers since signing. Cole seemed to be holding up the ball well and his presence had Hull’s defence flat footed as he fed Jack Collison a through ball for the midfielder to rifle home his shoot to make it 2 nil. After that goal it seemed West Ham parked the bus as Hull pushed them all the way. Rob Green was kept busy as West Ham defended deeper and deeper. But all of the chances Hull had were only half chances. The game ended with a two nil victory to West Ham yet another away win. I left Murray’s and yet again I cursed Dublin Bus as they had moved the bus stop and I had to walk up to College Green before I found one. Hope to see you all on the 26th November for the Derby game. BRIGHTON HOVE ALBION 0 vs WEST HAM 1. Splish, Splosh... and under the kosh... With weather conditions resembling a bibical downpour, members paddled, waded and swam into tonights meeting! "They better f**kin win" I thought to myself as I squelshed into the pub. Well they did... but with no style and by playing very little football. The BFS gameplan worked... park the bus infront of the goal, do everything possible to stop the opposition playing... get a lucky break and score... it worked a treat... but, boy was it dull to watch! In fact the match was so devoid of excitement that we spent more time on chatting and banter than actually watching the game? El Presidente even started asking quiz questions! I just hope BFS plays an attacking team for Saturday's home game against Leicester City, so that the 17 members who are travelling to the game actually get to see West Ham play some football! So, 3 points and second in the table... but... Zzzzzzzzzzzzzzzzzzzzzzzzzzz! “A good quiz is a disciplined quiz” so said our Quizmaster, President Fran Ryan. This was the introduction for one and all that the 2011 Dublin Hammers Quiz would be a serious affair with no prisoners being taken! He then entertained the assembled crowd with tales from his playing days as the committee made the final preparations. A great attendance then settled down to answer 100 questions over 10 rounds. The questions as always were very diverse with general knowledge, sport, music and picture rounds seeing some of us scratching our heads regularly. The first half of the quiz proceeded in relative quiet, however by the middle of the second half, the drink being taken had started to take it's toll and things became somewhat rowdier! Yellow cards were dished out for not putting your table number on the answer sheet and general abuse of the quizmaster or his ever jolly assistant, Liam McDonagh. When the bell rang it was time to hand up your sheets and it got to the stage that we were all like Pavlov’s dog – bell rang – sheets handed up! The final few rounds were close at the top of the leader board, but the final winners were the table of Bohs fans, (nice to see them win something this year! ), while the Simpsons proved to be a contentious affair with my own team finding ourselves level on points with Josh Holland’s team after the 100 questions (both of us well off the pace I might add!). For the first time in DH Quiz history we had a tie breaker to see who came last... things then descended into hilarity as the quiz master started to look through his tie-breaker questions… "I'm looking for an easy one, after all they did finish last" he explained. In the end Josh won the coveted title (with assistance from Liamo) and they each received a stick of rock! As always it was a great night with loads of laughs, wise cracks and general slagging. 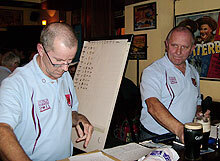 Great praise goes to Fran for putting together the questions and keeping the night racing along – mind you there will be questions asked about cosy cartels, seeing as the team containing Charlie, Gary and Eddie received a red card that was rescinded following discussions with the quizmaster! Was it on?... Was it off?... Was the room booked?... Who had the questions?... Yes, these where the questions being asked by the handful of members who had turned up for this meeting. When I arrived I was informed by the Chairman that the room upstairs was not booked and Fran had not been informed that it was a quiz night. The confusion was that the Dublin Hammers website stated that there was a Quiz, so somewhere along the line, Paul was given the wrong info? Ah well, these things happen, the few members that did turn up didn't seem to mind. Money was taken for the Leicester trip, as well as the free trip draw. A few pints were taken and Gary entertained us with his stories of everything from Rovers cross bar challenge on Soccer AM, to West Ham through the years, to the bets he has done, well done Gary. It was decided that the next meeting is to be a Quiz Night on October 24th, a monday night at 8pm. Members are asked to try bring along a few quests if possible. Keep an eye on The Dublin Hammers web site for more info about this event. NOTTINGHAM FOREST 1 vs WEST HAM 4. Another well attended meeting with a couple more new faces… welcome to them… saw the Hammers record a third straight away win… just that home form to sort out! A scrappy game, with any real quality football largely missing, came to life when the ball was deflected into the Forest net by Luke Chambers after a cross from Matt Taylor. This was immediately followed by a corner, headed down by Tomkins and Nolan finished with a stooping header. Robert Green pushed a volley onto the post as Forest rallied, but before long… another set-piece… corner… Nolan headed across the goal and Cole finished! Nolan then somehow missing an absolute sitter! So at halftime, 3-0 up and a satisfied gang of Dublin Hammers tucked into the bowls of sausages and chips kindly provided by Brannigans. Forest made substitutions and before long they had pulled a goal back, but 5 minutes later, Matt Taylor crossed into the box to find Winston Reid at the far post. He stabbed the ball into the back of the net for his first goal for the club! As 'the wally with the brolly" stood on the touchline waving his arms up, down and around heatedly… one wag started singing… "Y… M… C… A…" Everyone cracked up! In the final minutes the tv reception went missing but was soon restored for the final minutes of the game! Happy with the result… however… the Big Fat Sam ethos is really starting to kick-in now, all the goals were scored within the 6 yard box… and the running Dublin Hammers joke… "we never score from corners/set-pieces" has now been altered to "we always score from corners/set-pieces". WEST HAM 2 vs LEEDS UNITED 2. Turning the corner into Cathedral Street, I was faced with a sea of yellow and green… Kerry GAA fans, and plenty of them! I battled my way upstairs to find the room packed! It wasn't until half way through the first half that the green and yellow hordes departed and a well attended Dublin Hammers meeting was revealed! The game got off to a good start with a series of West Ham corners which resulted in a Carlton Cole goal, in his usual unique style, he fell backwards, stuck out a leg and the ball flew into the back of the net off the side of his foot! Yeeeaaaahhssss… COYI’s. However as the half progressed Leeds came more into the game, they were awarded a penalty after Taylor let the ball roll down his arm in the area, but thankfully it went wide to loud cheers! We also could have had a couple of penalties, but at half time we were still a goal to the good. Sandwiches and chat filled the break, and as the second half began, it was soon apparent that Leeds were not going to roll over and die. They came closer and closer to scoring… we knew it was coming… and of course it did! 1-1. But almost straight from the re-start, a West Ham attack down the right saw the ball crossed into the box from substitute Faubert and the Leeds defender slammed the ball into the back of his own net… "Just as well it didn't get to Cole" said one dublin hammers member! So leading again, somewhat luckily, but leading. Leeds came right back, and put our defence under some serious pressure, but we weathered the storm and then we started to get at them. Another series of corners saw Tomkins come close and Nolan could not react fast enough as the ball zipped across the area! Parker also hit the post after his shot was deflected! Then in the final minutes… just like Cardiff… some sloppy play… a quick one touch move from Leeds, and the ball was in the back of our net! Que loud angry shouting and shaking heads, held in hands. The young Miss Conway didn't seem too fazed by the goal as she lay stretched out on the bench underneath the TV, watching us all while sucking her thumb and clutching a cuddly dog... I wonder what see made of our reaction? To be fair, a draw was about the right result. But disappointing that for the second home game in a row we gave away a goal in the final minutes. Still, a good exciting game with plenty of chances at both ends! Well done to members and also the family over from London (nice meeting you) who battled against the GAA crowds to make it in! WEST HAM 0 vs CARDIFF CITY 1. As I headed into Brannagans, I didn't know how things where going to go this season for West Ham or the Dublin Hammers. 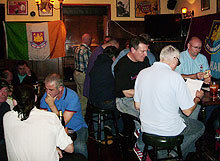 I needn't have worried about the Dublin Hammers as we had a good turn out for this match. It seems, being in the Championship and on BBC 1 didn't stop the members turning out for this one. The match saw 3 new debutants in the form of Kevin Nolan, Matt Taylor and Joey O'Brien. The match was not a classic by any means, well why would it be? it was the first of 46! Matt Taylor had a good match, his crossing was one of very few highlights in the match and O’Brien had one or two good runs down the right wing. It remains to be seen what the future holds for Scott Parker, Carlton Cole and Rob Green with all three being linked with moves away from Upton Park. On todays showing Scotty’s head was not in the game, if any Prem Managers where looking at him today he didn't do anything to impress. What is certain now is that Sam Allardyce will be under no illusions about the scale of the task in front of him. Cardiff’s goal when it came in injury time was an error from Herita IIunga and maybe Rob Green could have done better with the shot from Miller. Still look on the bright side we still have 135 points to play for. On a lighter note, it was good to see two new faces in at the meeting and Timmy Holland back in full flow. When we retired down stairs our newest member Elliott Lloyd was there to meet us. Hope to see you all again in two weeks time.